The owners of this early-19th-century house in Kent, England, had relocated from London and were eager to make the most of their country home’s connection with nature. They thought the dining room, with French windows and views to the garden, would be just right for a kitchen and dining area, so they called on James Mundy, director and lead designer at J M Interiors, to help them make the change and create a cozy country space. “It was quite a big project,” Mundy says. 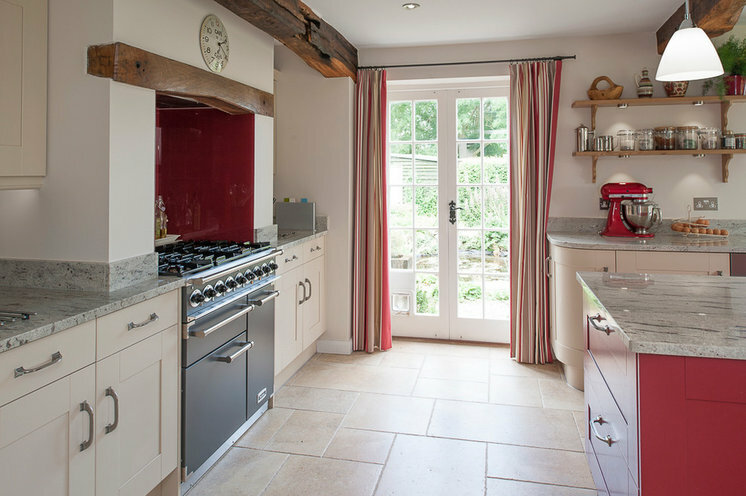 All of the plumbing, electrical and heating had to be altered to accommodate the needs of a kitchen. However, the final design stays true to the home’s traditional country style — with a modern, colorful twist. 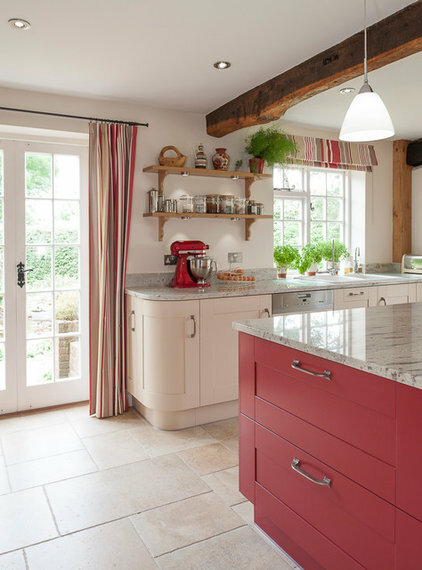 This elegant kitchen merges country-style comfort with chic modern touches. 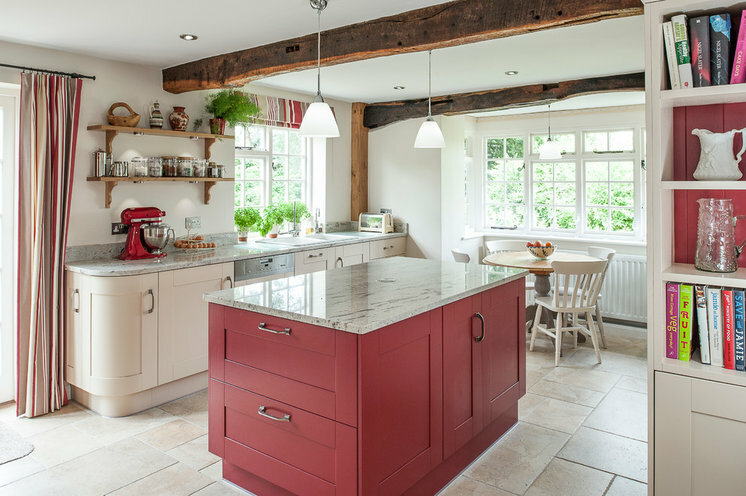 The stately exposed beams and Shaker-style cabinets evoke the heritage of the property, which was built in the early 1800s, but small details bring the kitchen into the 21st century. Mundy selected a calming creamy white for most of the spacious room, but interspersed it with crimson accents, “just to give it a bit of a wow,” he says. 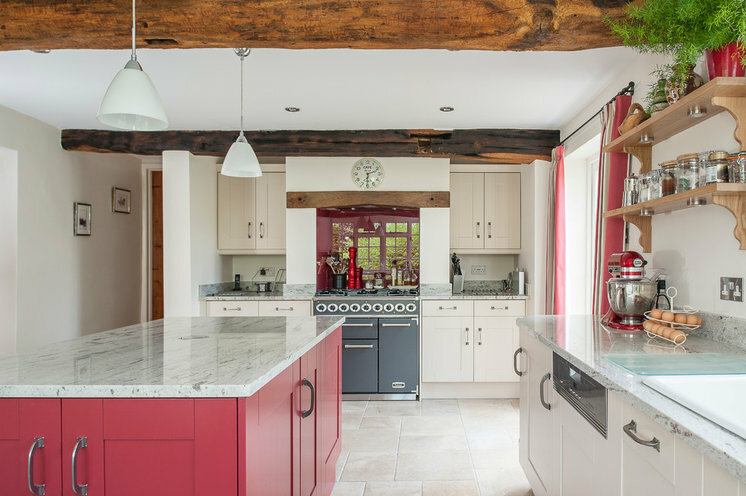 The colorful island provides the kitchen with a focal point, while additional details in the same shade, such as the KitchenAid mixer, tie the space together. The current layout of the kitchen reveals hints of its past as the property’s original dining room. The oven range is in the recessed area where the old fireplace had been located. The treatment of the old fireplace exemplifies Mundy’s aim to “keep the kitchen set within the character of the house,” as he says, while also giving it a subtle modern twist. 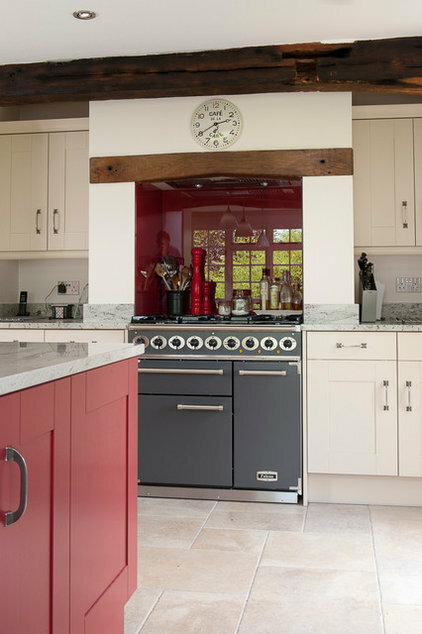 The oven range and exposed beam are traditional, but the glossy red glass walls around it make a bold statement and link visually with the island. He says that the idea of covering the area with glass was a joint decision with the owners, with him choosing the glass and them deciding on the color. The French doors were already in place and lead out into the large garden. 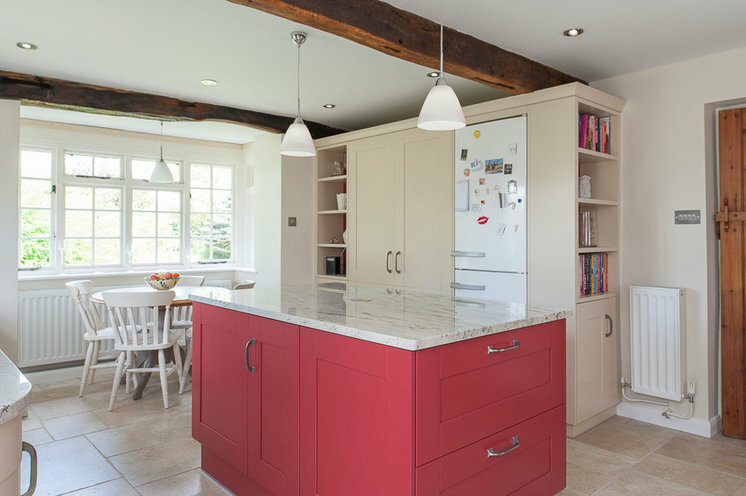 Keeping a strong connection to the outside was one of the reasons Mundy’s clients wanted to move the kitchen into the former dining room. “They have fully embraced the countryside lifestyle,” Mundy says. That includes cooking, entertaining friends and family, and spending as much time as possible in the garden. A row of fresh herbs on the windowsill hints at the couple’s love of cooking and nicely brings a touch of nature indoors. The blinds, as well as the matching curtains on the French windows, incorporate splashes of crimson and were found by the client. The round table and matching chairs are the clients’ original set. 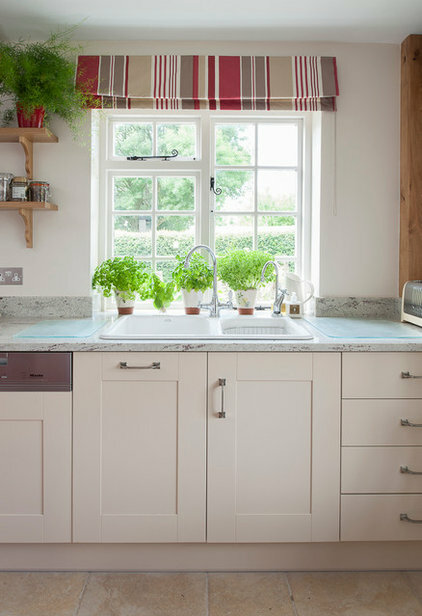 The clients were eager to place their table in the bay window, overlooking the garden, and the rest of the kitchen was built with this idea in mind. “It was always going to be a little seating area,” Mundy says. This pantry, which was custom made by JM Interiors, was designed in close collaboration with the clients. “They wanted decent pullout storage at the bottom,” Mundy says, which is why they included four spacious basket drawers. Solid oak door racks provide additional space for spices and condiments. The pantry is also equipped with LED lighting, which comes on automatically when the doors are opened. 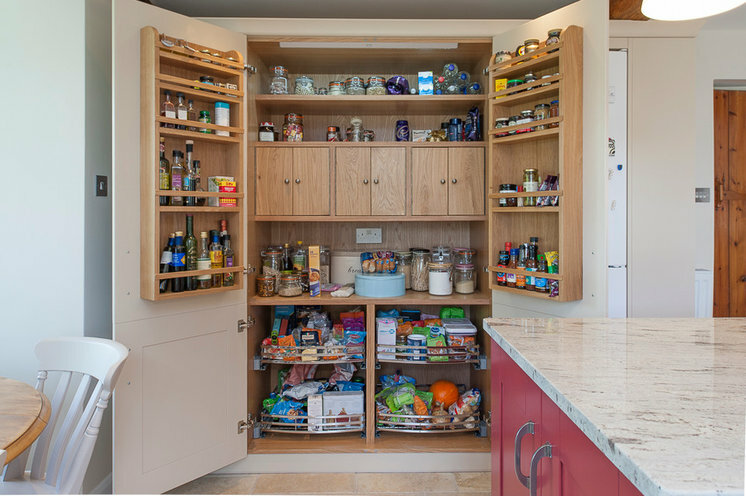 Mundy says that these sorts of pantries are becoming more popular, with many clients gravitating toward custom furniture pieces as opposed to relying solely on open shelving. The whole cabinet, which also houses the refrigerator and some shelves and cupboards, is designed as the main storage area. “That leaves the rest of the kitchen quite open,” Mundy says. Mundy added two rows of open oak shelving to bridge the gap between the window and French doors, and to keep small everyday items easily accessible. Although at first glance the kitchen countertops seem to be made out of marble, they’re actually granite. 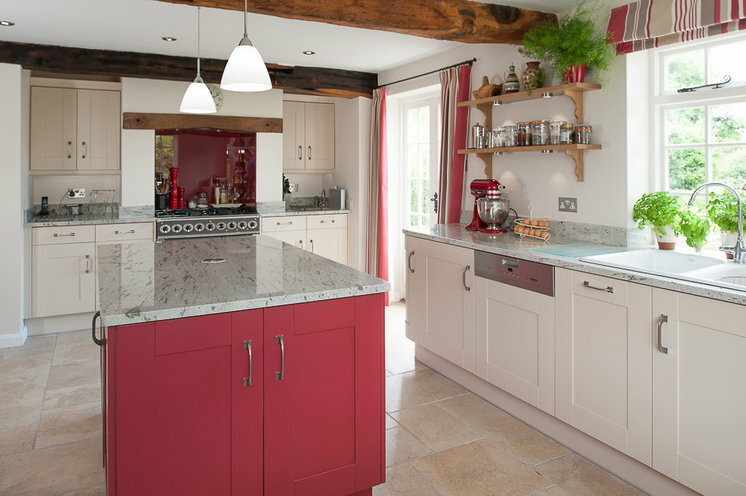 “Granite for kitchen surfaces is a far more suitable product,” Mundy says. “Marble tends to be quite soft and scratches easily, whereas granite is so much more tough, durable and hard wearing.” The circle in the center is a pop-up Evoline port containing USB and plug sockets — thoroughly 21st century but without changing the look of the cozy country kitchen design.